The official Pacific Fisheries Management Council's (PFMC) Chinook Salmon count is in. Spawning escapement was 55,939 to the hatcheries, 122,018 “natural” spawners, 13,574 fish recreational catch, 101,476 fish Indian catch, 9,101 fish non-landed mortality for a total return of 302,108 Chinook Salmon. 72,357 fish and a total return to the egg taking stations of approximately 7817 fish. If we correlate as best possible the 2012 returns known escapement or previous known escapement from 1978 to 2010 meta tables, we can estimate the largest pre-dam run size at 153,000 to 160,000 fish. Keep in mind in 1915 there was no modern troll fleet or foreign mid water trawlers. With a 2012 return almost double the highest documented pre dam return, it is obvious we must hurry and get the dams removed on the Klamath to “restore” the runs to their much smaller pre-dam size! The Mercatus Center just released their latest state freedom index. Reason magazine's J.D. Tuccille takes a look at it. The bottom ranking states? You might have guessed: New Jersey, California and New York. No Prop 30 Money For Schools? Ha, ha! The California Political Review reports that most or all of the revenue from Prop 30- that recent sales tax increase- will likely go to paying for teacher's retirement fund debt. Bloomberg has the whole story. Told ya so! Actually, I didn't, but plenty of opponents to Prop 30 did. You can argue about the sustainability of regular Social Security all you want, but the Washington Examiner reports S.S. Disability (not quite the same as Social Security) is nearing collapse. By 2016 it's projected to run out of money. This is a toughie for me. I've always felt there should be some sort of assistance for people unable to work. The wifey is on SSD, her main problem being she's immune deficient so gets sick fairly easily, and when she gets sick it can be a serious problem. I'd like to think there would be help for me should I be sick or injured and can't work. One problem with Disability is they've lowered the qualifications, allowing many more to take advantage of it. I've often joked that the one way you can tell if someone is on disability is that they do everything everyone else does...but go to work. Yep. same with the wife, so it's not always obvious, but I've known more people on disability that could work than couldn't. Years ago I knew a maintenance gardener in Eureka. She had a guy helping her. She told me later she ran into a problem when she went to file taxes. The guy she had helping her told her she couldn't use his name because he was on disability and would get in trouble if they found out he was working, especially doing hard physical work. Gee. Who'da thunk? About that same time there was a tenant at a place I worked at who started doing lawn work and cutting firewood to sell. He had cords of wood stacked in the yard. I got to talking to him and he told me he was on SSD, too! He had both shoulder joints replaced. That qualified him for SSD, but he did hard physical work regardless. I get the impression all joint replacements qualify people for disability. I worked for a guy that lived in Pine Hill. He was a manager for a grocery store and limped around a bit when walking. Then he got a hip replacement and automatically went on disability. In his case, I suppose he needed it as last I saw he was either in a wheelchair or on crutches. That raises the question of the efficacy of hip replacements if nothing else. The guy could walk and work until the hip replacement. Now he just sits around. I still work for a another person that had a hip replacement. I never knew there was anything wrong with her until after she had the surgery and told me. She went on to tell me they put her on permanent disability as a result. At the time she said she didn't want to be on permanent disability. About a month later I stop by and she tells me she wants to keep disability (doesn't take long to get used to it). Then she got a job doing home health care, or some such, since you can still earn up to a certain amount even if you're on disability. I can't tell if the hip replacement helped her as she still walks as she always did, but at least she got her disability. I'm not sure how they can deal with the S.S.D. collapse. I'd hate to be the one deciding who qualifies and who doesn't. If they do raise requirements, there will be the additional problem of all those people back on the job market. What will the unemployment rate be then? It might be too soon for me to crow about this. Maybe we'll never know exactly who used what in the supposed chemical attack in Syria, but the latest evidence suggests I may have been right. AntiWar.com reports that evidence so far leads to Syrian rebels doing it. I wrote on Friday: "... the rebels have every reason to create an incident. I wouldn't put it past them to create an incident- real or fabricated- even if it meant making a crude chemical weapon to use on their own people. Then they could get the U.S. and the British to do their bidding for them. They'd have everything to gain and nothing to lose." The rebels don't have anything to lose. As Antiwar.com reports: "Incredibly, even though all the evidence now points to the headline “Syria uses chemical weapons” being wrong on two fronts, House Intelligence Committee chair Mike Rogers (R – MI) is still insisting that the incident is an excuse for the US to attack Syria and install the rebels.". Just noticed this online form at the Times- Standard web site. They want to know where Eureka's most dangerous intersections are. I'm guessing they'll be including the results of their survey in a story on traffic safety? Off the top of my head I can't think of any intersections that stand out as being particularly dangerous. A few years ago I would have added Trinity & H Streets, heading west. There used to be a small dump truck parked near the NE corner there. With the foliage alongside the sidewalk, it completely blocked the view north down H Street. If you wanted to cross H Street you had to slowly creep out to see as best you could past the dump truck. At some point, though, you had to just close your eyes, hope for the best and race across H Street as quick as you could. That was hairy, but the dump truck was moved a few years ago. The only other one I could think of is our corner at Trinity and E. We've had accidents here before because of poor visibility. It's likely to get much worse once the Matteoli's street trees get larger, but that might take a few years. Another earthquake warning commentary by Lori Dengler in the Times- Standard. She seems to suggest the best warning of a potential tsunami is the ground shaking beneath your feet. I believe she's wrote that before, as have others. I realize she's the expert, but I think she may be at least partly wrong. What if the earthquake generating the tsunami is across the ocean where you don't feel it? I've mentioned here before that one thing common with tsunamis I've read about is the water recedes real fast before the tsunami actually comes in. Might that be a better warning? You can have earthquakes without tsunamis, but the water always recedes before tsunamis. Just before the tsunami in Hilo, Hawaii the water receded so much a bunch of tidepools were uncovered with fish flopping around in them. A schoolteacher supposedly sent her kids out to catch the fish. The tsunami caught them. They didn't return. In that big one in Thailand some years ago, the water receded way back. Tourists on the beach thought that was pretty neat so they went out to check out the previously covered beach. The didn't make it back, either. Maybe it doesn't happen all the time (although I don't know why it wouldn't) so that's why the experts don't mention it? In any case, it should be mentioned and we should all keep that receding water in mind. It should work whether or not you feel an earthquake, although it may not give as much time to react. I've heard so many disparaging remarks about Pat Buchanan. I think he's pretty good. He's spot on again in todays commentary at Antiwar.com on efforts to lead us to war. About the only difference I have with him in this case is that cooler minds seem to have prevailed over the latest hoax. I'll give Obama credit for that, though this is far from over and he does seem determined on creating an issue with Iran. I don't often comment on foreign affairs here or elsewhere. I did in regards what I felt was the latest attempt by powers- that- be to incite an attack on Syria. It looks like the second cry of chemical weapons use might be another hoax by the rebels. I suspected it was from the get- go. I'll admit many I heard from were skeptical, too, but that even a few fell for it was a sad commentary on how easily some are swayed. It would be foolhardy for the Assad regime to use chemical weapons. They have the west biting at the bit to attack them. Why give them an excuse? They'd have much to lose and nothing to gain by doing so. On the other hand, the rebels have every reason to create an incident. I wouldn't put it past them to create an incident- real or fabricated- even if it meant making a crude chemical weapon to use on their own people. Then they could get the U.S. and the British to do their bidding for them. They'd have everything to gain and nothing to lose. That's hopefully my last foreign affairs commentary for a while. "Today, liberalism seems to have changed. Today, many progressives seem to believe that government is the horse, the source of growth, job creation and prosperity. Capitalism is just a feeding trough that government can use to fuel its expansion." The most recent subject on the county's new Open Humboldt Forum is campaign finance reform. Should there be limits on how much candidates can raise overall, individual donation limits, or both? There's also a poll you can take regarding what the limits should be. I've wrote here before that campaign finance reform isn't a big issue with me and is overrated. Truth be told, much of the campaign "reform" measures we see are just one side trying to gain an advantage over the other- the recently declared unconstitutional Measure T being an example. My comment to the forum yesterday was along the lines of what I've written here before: Individual donation caps put the underdog at an even bigger disadvantage. The underdog starts out with the least support. Limiting his supporters to only donating a certain amount of money assures he remains at the bottom. One donation from a wealthy supporter could get him into the big leagues, at least as far as money goes. I won't openly oppose overall campaign caps- say, $100K total for a candidate in a given race. That means nothing for the underdog since he likely won't raise anywhere near that much, especially if individual contributions are capped. After I made my comment yesterday, I came up with a compromise between overall campaign limits and individual contributions. Let's say there's a total cap on $100k per candidate in a three way race. The most popular candidate easily reaches the limit by the first reporting period. The second most popular comes in just under with the underdog only raising half. How about individual contribution limits for those two candidates be suspended at that point to allow them the best chance to catch up with the #1 candidate? By no means would that mean the two candidates could catch up with #1. They might still remain mired well below, but they have a better chance. If they don't make up the difference, oh well. They just don't have the support. Seems an even playing field is what most of us really want. Such a plan would work toward that while still giving us "reform". Seems fair enough to me. Got Daily Deals: Another Sales Gimmick? Someone told Connie about an advertisement in the Times- Standard for Eureka's Fin- and- Feather pet shop. It was something about a voucher for 50% off or something along that line. You had to go to the Times- Standard web site to get it. We went to the T-S web site and the ad was right at the top of the page. You click on the ad and it takes you to this Daily Deals web site. This deal is paying $10.00 for a $20.00 FNF store voucher. The deal is only good for another 13 hours or so, according to the site, but you can use the voucher through to September 30. Makes me wonder if there's some other catch and I might regret this? We need some stuff from FNF so we click the Buy Now link. That takes you to a page for credit card and personal info. I elected to sign in with Facebook, and wonder if I'll regret that. I enter and submit my credit card info expecting to get a link to a printable coupon but nothing happens. I check my e-mail right away and there's an e-mail invoice for my voucher which says we can't print the coupon until we're able to use the voucher. Then it says the "check the fine print to see when voucher can be redeemed". Uh, oh! Have we been had? Nope. We go back to the Daily Deals offer page and the "Fine Print" is towards the bottom. It says the vouchers can be redeemed beginning March 25. Looking again at the e-mail invoice, there's a link at the bottom where you supposedly can get your coupon once it's redeemable. We'll see if it works. I'll finish up the review after we've printed up the coupon and redeemed it. Anybody have any experience with any of these prescription drug discount cards? I received a card from that outfit with my mortgage statement the other day. Did GMAC ever send out advertisements? I don't know as I did all my business with them online the last few years. Green Tree apparently does and I'm not sure whether I trust Green Tree to begin with. Supposedly using the card saves you a bunch of money on prescriptions. This one actually lists Rite- Aid as a store that accepts them. That's where I go so was thinking of giving it a try. I'm just wondering if there's any downside to it? Why would they give me this free discount card unless they're getting something out of it? I received a similar one from a friend a couple years ago. I tried using it at the old Henderson Center Pharmacy. The folks there said they didn't know anything about the card as it wasn't registered with them so I couldn't see if it worked or there was any down side to using it. Just wondering if anyone tried using one and regretted it later? Not so much in Humboldt, but I found this map interesting. It shows which counties are losing the most police officers. The Sacramento Bee story isn't very specific in regards why. If it was just the poorer counties that were hit harder by the recession, you'd think Humboldt would be a bigger loser. Maybe it's just budgeting priorities as set by the counties? You can get a more readable size by clicking on the picture in the Sacramento Bee article. It's no secret I think Eureka's Street Tree Program is misguided, at best, and will cause problems more than anything else. I was furious when I'd heard my in- laws across the street decided to fall for it. They're having trees planted on both sides of their house. 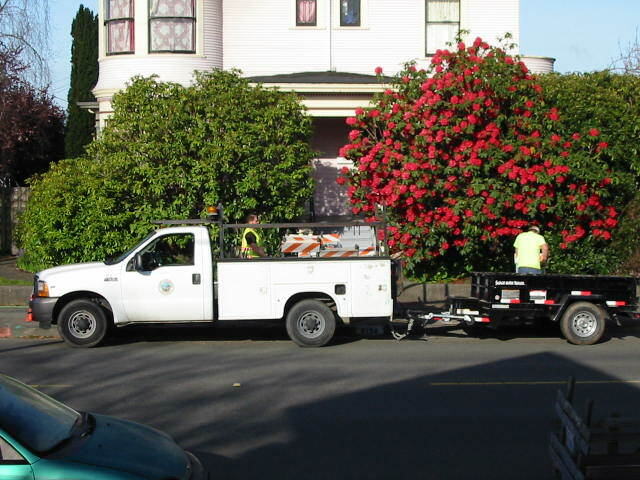 I was also surprised this morning to see two City of Eureka trucks with what I would assume are city workers tearing up the pavement to plant the trees. I was under the impression this was mostly a private and volunteer effort, albeit encouraged and subsidized by the city. Nope. We're actually using tax money to create problems that will cost more tax money in the years to come, never mind the traffic accidents and crime that- despite the tree supporters claims- are sure to result. Funny thing about the example here is Marc asked me some months ago what it would take to cut back those huge rhododendrons blocking the view of their front windows. Then he goes ahead and puts trees on the sidewalk to further block the view! We've already had our fair share of collisions here. You can bet there will be a few more because the trees on E Street will obscure the view to the north even more. The only fun thing in this particular case is those trees will eventually block the pedestrian crossing sign on the corner. You can be sure I'll enjoy calling the city and asking that the sign be removed since the trees are blocking it anyway. Ironic that what some deem "traffic calming measures" are blocking traffic warning signs, huh? The Santa Rosa Press- Democrat has a photo of what the proposed Willits Bypass will look like. Clicking on the picture makes it a little bigger. Looks good to me but, as I've written before, if somebody has a better idea I'm all ears. A slideshow of rural North Korea. Click on the thumbnail pics below the main screen to view a larger picture. Link courtesy of Radley Balko. Walter Block has a unconventional view of Iran. Liberty magazine's Jayant Bhandan shares some observations from his travels in communist China. Some discussion going on over at the Times- Standard article on traffic calming and Eureka's high accident rate. I was glad to see the police officer quoted point out that pedestrians are at fault in many accidents. Seems to me the vast majority of car vs. pedestrian accidents could have been avoided had the pedestrian paid more attention to oncoming traffic. Can anyone think of one vehicle vs. pedestrian accident around here that could NOT have been prevented had the pedestrian been paying more attention? I can only think of one that's close: A person I know got hit in a crosswalk while crossing on a green light. I believe the car turned into the crosswalk from behind her, but even in that case had she been paying closer attention to traffic she might have avoided being hit (I do check behind me when I cross the street). That one might not be as clear cut as most. In nearly all cases I'm aware of, had pedestrians been looking for oncoming traffic, they could have avoided being hit, regardless of what the driver was doing. Metropolitan Life Insurance is moving all or most its company out of California and five eastern states. All of those states being high regulatory states with a high cost of living. North Carolina will be the recipient of around 2600 new jobs. The reason: "The strong business climate, access to universities and colleges and the desirable cost of living in North Carolina were significant factors in choosing to establish these new campuses in Cary and Charlotte," MetLife executive vice president Eric Steigerwalt said". I've found it interesting that companies leaving the state never overtly criticize California. Campbell's Soup and others said the same sort of thing. I'm guessing they don't want to burn bridges? The powers- that- be of Humboldt County now have an online forum meant to receive input from residents on issues of the day. County staff will supposedly be reviewing the comments. First topic is how you would prioritize the county's budget for the upcoming fiscal year. Be interesting to see how this works out. I can't help but wonder if it might end up like the local blogosphere and be either one- sided, or with various sides arguing at each other? Hat tip to the Humboldt Taxpayer's League for the heads up. I missed the mention of it in the Times- Standard. Who'da thunk that a small town in the heart of yuppieness would reconsider their limits on chain stores and fast food? The Santa Rosa Press- Democrat reports the City of Cotati is taking a look at allowing more chain type businesses. They have too many empty storefronts and want them filled up. Speaking of issues and the Left vs. Right divide, the water fluoridation issue sure makes it interesting. I've been following the fluoridation debate down in Sonoma County. The Sonoma County Board of Supervisors seems hell bent on spending millions to fluoridate the county water system. This, despite what seems to be a majority opposed to it. At least that's the impression I get from reading comments to news articles. I found it interesting to see some regular commentators to the Press- Democrat I've considered the small government conservatives come out supporting fluoridation- my individual choice argument falling on deaf ears. What I deem the normally big government progressive types, who you'd think would support any public health measure, strongly oppose it. Fluoridation makes for some interesting political bedfellows. More than anything shows the political spectrum shouldn't be confined to a Left vs. Right plane. The Nolan Chart makes more sense than just limiting ourselves to Left or Right. It's an age old debate among libertarians whether efforts would be better spent working for change within the Republican Party as opposed to going it on our own. That debate has started up again in some circles with at least two recent articles on the question. I'll agree, as I have here before, that libertarians might be more compatible with Republicans on some issues. If nothing else, most Republicans at least give lip service to wanting less government. I just can't come up with many examples where a strong majority of Republicans have supported libertarian issues. I suppose tax cuts could be one. Maybe opposition to more gun control measures another. But even support on those issues can be tepid depending on the situation. Am I missing something? As for me, I'm more that willing to work with anybody and any party in support of libertarian issues. I haven't found myself exclusively with the Republicans in that regard so why would I want to switch to the GOP? Hard to believe Yahoo News published what I thought a fairly even handed article on fracking. My main concern is the amount of water it uses. Millions of gallons per well essentially gone forever once it's pumped thousands of feet underground. Some of you have heard about the Florida guy that got sucked into a sinkhole along with part of his house yesterday. Wouldn't that be your worst nightmare? It made me wonder what kind of chance there is of that happening here? Lewrockwell.com posted a story today with a map that put my mind at ease. Looks like we're not in a danger zone. Still, just cause you're paranoid...and sometimes sinkholes can be caused by broken water lines and such. Remember that big one in San Francisco a year or two, or three ago? I wonder about H Street in Eureka, a few blocks south of Harris, every time I drive by there. The road always has two or three spots where water seeps up through the pavement. Must be an underground spring or something. I can't help but wonder if that spring is slowly eating away at the ground underneath? Will it finally collapse into a huge sinkhole one of these days when I'm driving over it? 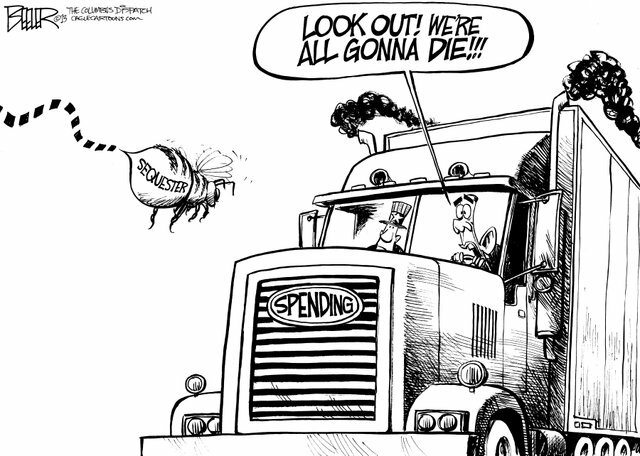 "Even with the sequester, the federal government is expected to spend more this year than it did last year. 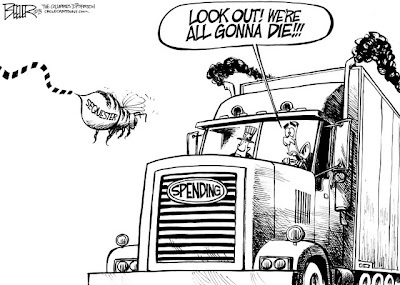 The government spent $3.5 trillion in 2012 and i expected to spend $3.6 trillion in 2013"